She found out about Babes in Borrego the day before the ride. After a quick cruise on our blog she decided she was IN! Stacey Bookshier rolled up to the meet-up spot at our first ever campout not knowing anyone. 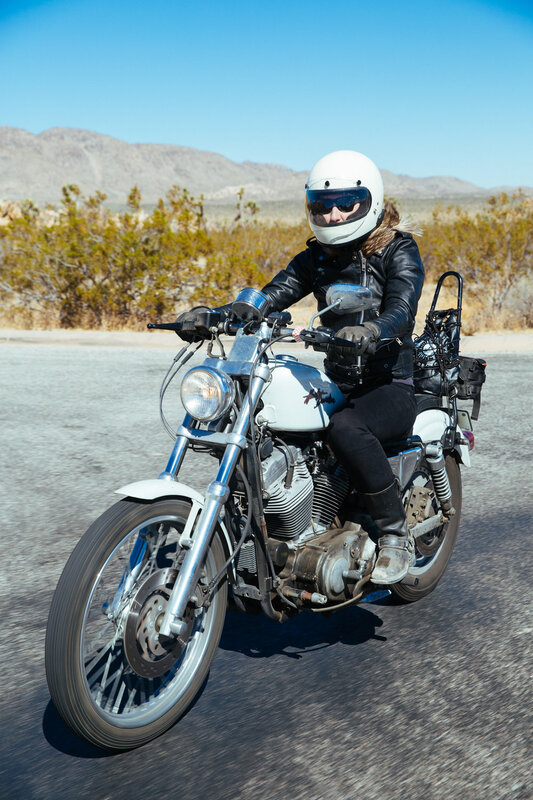 Her vintage moto didn’t let her down on those desert roads and she walked away from that weekend with new friends and a new annual tradition of attending all of our Joshua Tree campouts! Read on to hear more about Stacey and her experience that weekend. I feel like I’m always the last to know and for Babes it was true. I didn’t really use social media when Babes was announced so I had no idea. I found out a day before the event from my friend Isaac who owned Trophy Motorcycles in San Diego. I checked out the blog and read “roll call” and I was in. When I arrived at the gas station there were only three other women there, Caroline, Lindsey and Rebecca. They offered to throw my hastily packed camping gear in their chase truck. I was stoked because I had this flat seat with all my gear strapped down with bungees threatening to fall off. As more women trickled in I was amazed how many people the post had reached. When I was younger I took solo car road trips but never to a meet up or an event. At the meet up I didn’t know anybody. I had texted two of my friends about it the day I found out. One knew about it, but it looked like they weren’t going to come. To my surprise they pulled up to the campsite that evening, and I have been to every Babes in Joshua tree with them since. My bike at the time was vintage and didn’t want to start when everybody was ready to pull away. I panicked and thought I was going to miss out. I eventually kicked it over, thankfully, and had a blast riding with everybody. 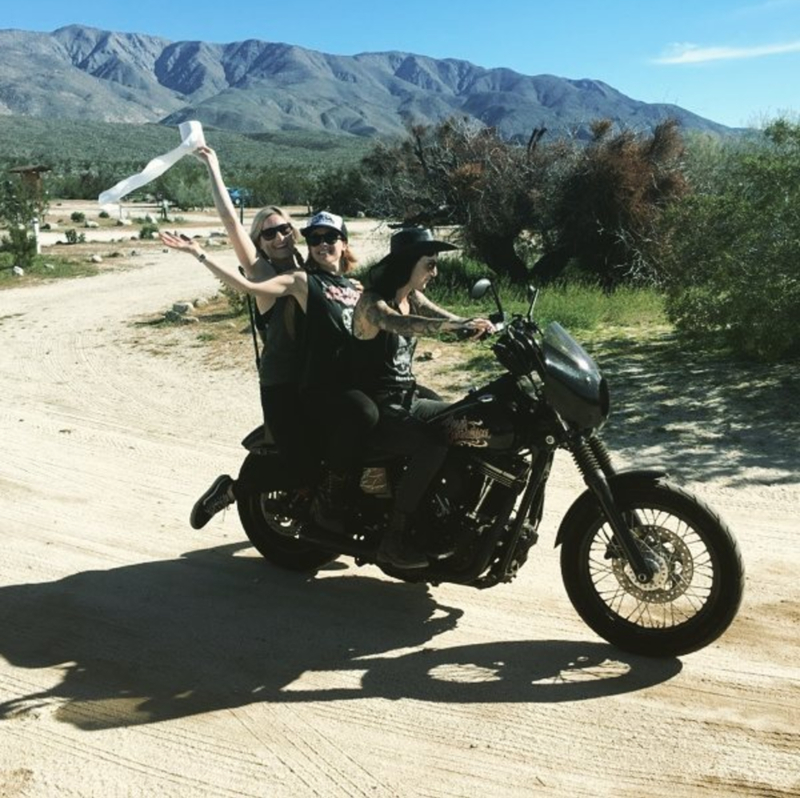 I was so impressed with the amount of thought and love that Anya and Ashmore put into Babes in Borrego not knowing what the result would be. I am grateful for your efforts ladies. Everything just unfolded beautifully. There were so many personalities it was like a little buffet of meeting interesting, positive women. Sitting around that fire and hearing the bits of everyone’s background made that dry lakebed an unexpected comfortable place to be. It was my first night playing Cards Against Humanity and it was on a homemade deck that made me think they made the game up themselves. I didn’t pack a tent but luckily Rebecca and Lindsey let me crash theirs, I would have probably froze if not for them. There are a few that I still get to see from time to time. I was really stoked to meet more women from San Diego, some I see more often than others. I met Sanna at the first Babes, (calling her out), she doesn’t remember me from then even though she drank my water. Sanna, I love you and I’m so happy we became good friends. At the first Babes I was recently unemployed but found a job shortly after. My extremely talented and good-looking boyfriend of 6 years plays bass in The Distillers, it’s really humbling and exciting to see him play. We have a house just outside of Downtown San Diego, with our 3 dogs, where we are working to become more self-sufficient with our small vegetable garden. I realized at the first Babes that I had met Lindsey at Elusive Unicorn years before and we had both attended Slab City Riot. I’ve been to another large organized campout out since, other than Babes, but they’re too much party for me. I have been on a couple local camping trips, with women I met through Babes and their S.O.’s, to Borrego and Idyllwild. It is dizzying to think of all the details that are put into these events. Growing from 50 to thousands of women is astonishing. I am in awe of the women who come from all over to be a part of this and grateful for the people it has brought into my life. I guess you take the good with the bad. Motorcycle events are a lot more crowded than they were years ago, but with that more products and manufactured parts have become available. I love that there’s finally riding gear that don’t make women look like they’re about to get on the back of a road sofa.